What is Door Bell 2.0? Door Bell 2.0 (or DoorBell20 for short) is a Bluetooth Low Energy (BLE) appliance to monitor a door bell and send notifications whenever the door bell rings. It turns a conventional door bell into a smart door bell that can be connected to the Internet of Things (IoT)., e.g., using the DoorBell20 If This Then That (IFTTT) client. Thus, DoorBell20 is the modern version of a door bell, or, as the name suggests, the door bell version 2.0 for the IoT era. Full source code and hardware design is available at GitHub. 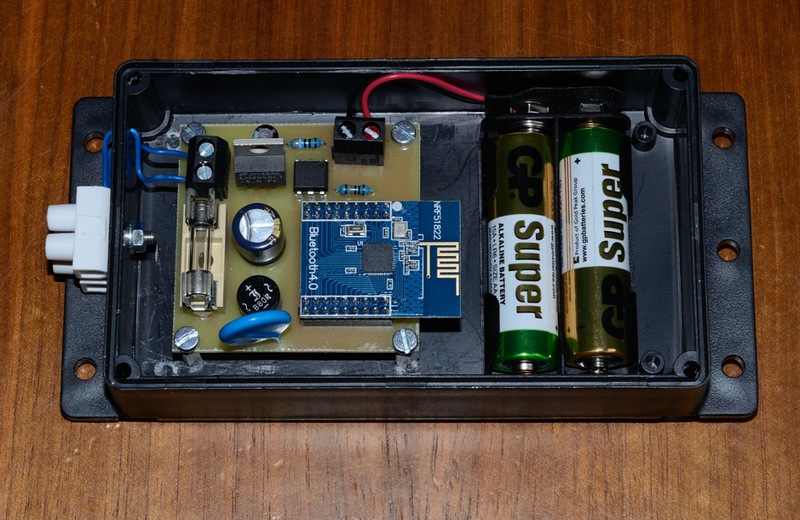 The DoorBell20 monitoring device, which is connected in parallel to the door bell and wirelessly via BLE to a client running on a remote IoT gateway, e.g., a Raspberry Pi with Bluetooth stick. A DoorBell20 client running on the IoT gateway passing on notifications received via BLE to a remote cloud service. Different clients can be implemented for different IoT cloud services. So far, DoorBell20 includes a client for If This Then That (IFTTT), which makes it very easy to trigger different actions when a door bell event is detected. For instance, a notification can be sent to a mobile phone or trigger an IP camera installed at the door to take pictures. The following ASCII art shows the big picture of how DoorBell20 works. The following images show the DoorBell20 monitoring device, its connection to a door bell, and a door bell event notification displayed by the If This Then That (IFTTT) app on a mobile phone. DoorBell20 device connected to door bell. 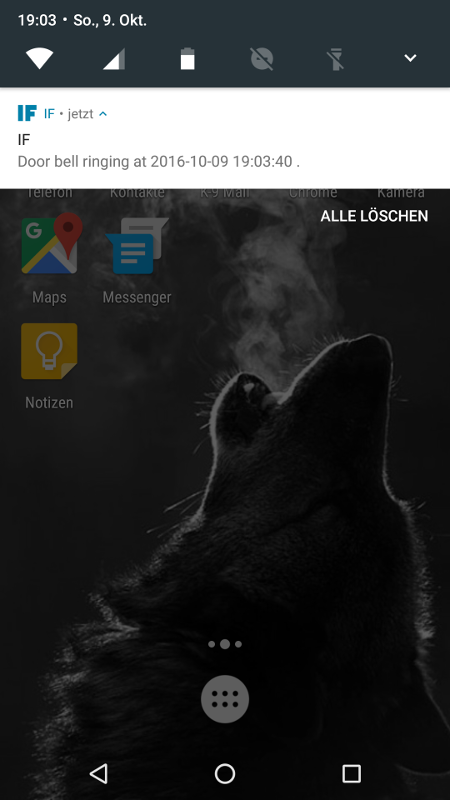 IFTTT client showing door bell event notification. Open-source software and hardware. 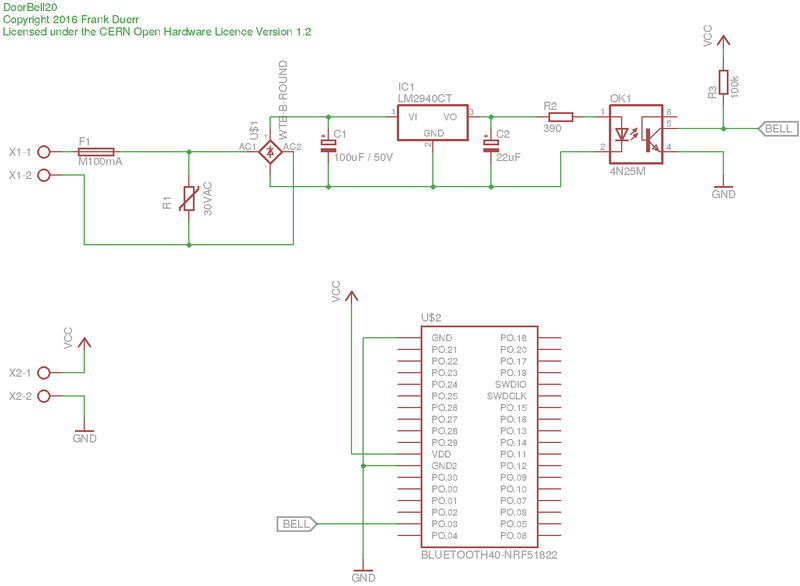 Source code for the door bell monitoring device and IFTTT client as well as Eagle files (schematic and board layout) are provided. Maker-friendly: using easily available cheap standard components (nRF51822 BLE chip, standard electronic parts), easy to manufacture circuit board, and open-source software and hardware design. Includes a client for the popular and versatile If This Then That (IFTTT) service to facilitate the development of IoT applications integrating DoorBell20. Liberal licensing of software and hardware under the Apache License 2.0 and the CERN Open Hardware License 1.0, respectively. 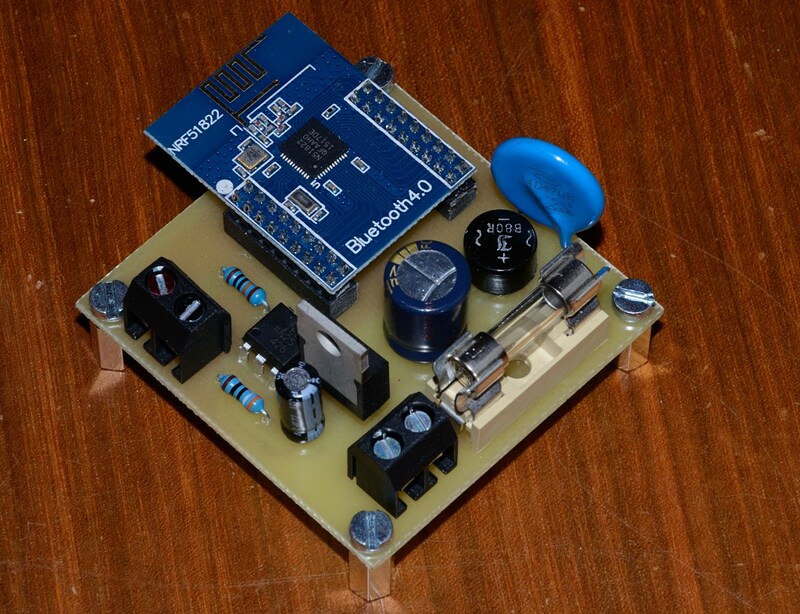 The DoorBell20 monitoring device is based on the BLE chip nRF51822 by Nordic Semiconductors. The nRF51822 features an ARM Cortex M0 processor implementing both, the application logic and the BLE stack (so-called softdevice). DoorBell20 uses the S110 softdevice version 8.0. See next sub-section on how to flash the softdevice and the application code. We use a so-called “Bluetooth 4.0” breakout boards with an nRF51822 (version 3, variant AA w/ 16 kB of RAM and 256 kB flash memory) and two 2×9 connectors (2 mm pitch), which you can buy over the Internet for about 6 US$ including shipping. 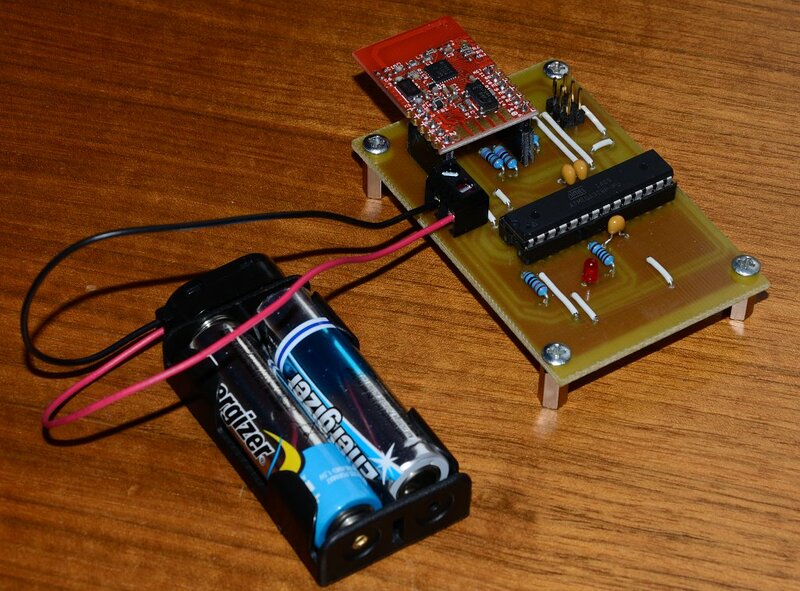 We isolate the 12 VAC door bell circuit from the microcontroller using an opto-isolator. A rectifier and 5 V voltage regulater is used to power the LED of the opto-isolator whenever the door bell is ringing. A GPIO pin of the nRF51822 connected to the other side of the opto-isolator is then detecting the event. In addition to the integrate protection mechanisms of the LM2940 voltage regulator (short circuit and thermal overload protection, shutdown during transients), a varistor protects from voltage transients since many door bells are inductive loads inducing voltage spikes when switched off. Since varistors age with every voltage transient, a fuse is added to protect the door bell circuit from a short circuit of the varistor. The nRF51822 is powered by two AA batteries. No additional voltage regulator is required, which increased the energy efficiency, and the monitoring device is expected to run for years from a pair of AA batteries. Note that we did not implement a reverse polarity protection, so be careful to insert the batteries correctly. 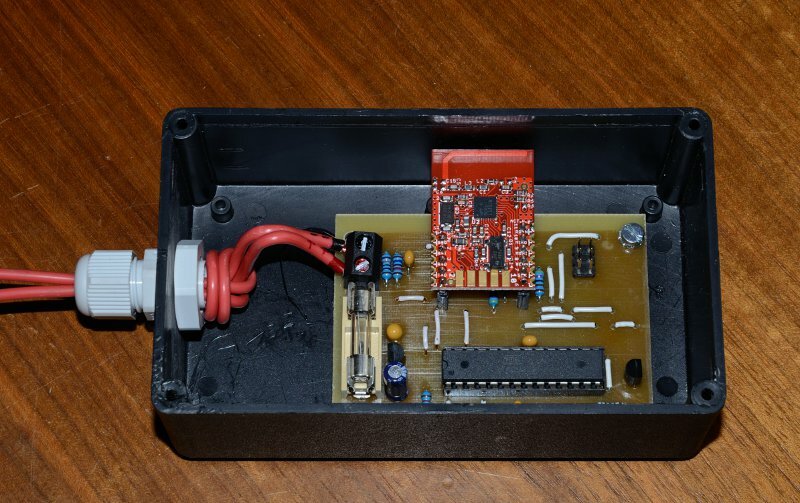 The schemtic and circuit board layout (PCB) of the DoorBell20 monitoring device for Eagle as well as the firmware can be found at GitHub. We deliberately used a simple single-sided through-hole design to help makers producing their own boards. DoorBell20 can be connected to any BLE client running on a remote machine. After receiveing a BLE notification about a door bell event, the client can then trigger local actions, and can forward the event to a remote IoT cloud service. DoorBell20 comes with a client for connecting to the popular If This Then That (IFTTT) cloud service. Whenever a notification for a door bell alarm is received, a web request is sent to the IFTTT Maker Channel triggering an event with a pre-defined name. You can then define your own IFTTT recipes to decide what to do with this event like showing a notification on your smartphone through the IFTTT app, as shown in the following image. For further technical details, please have a look at the documentation and source code provided at GitHub. Key 2.0 (or Key20 for short) is a Bluetooth IoT Door Lock. It turns a conventional electric door lock into a smart door lock that can be opened using a smartphone without the need for a physical key. Thus, Key20 is the modern version of a physical key, or, as the name suggests, the key version 2.0 for the Internet of Things (IoT) era. Door lock controller device, which is physically connected to the electric door lock and wirelessly via BLE to the mobile app. 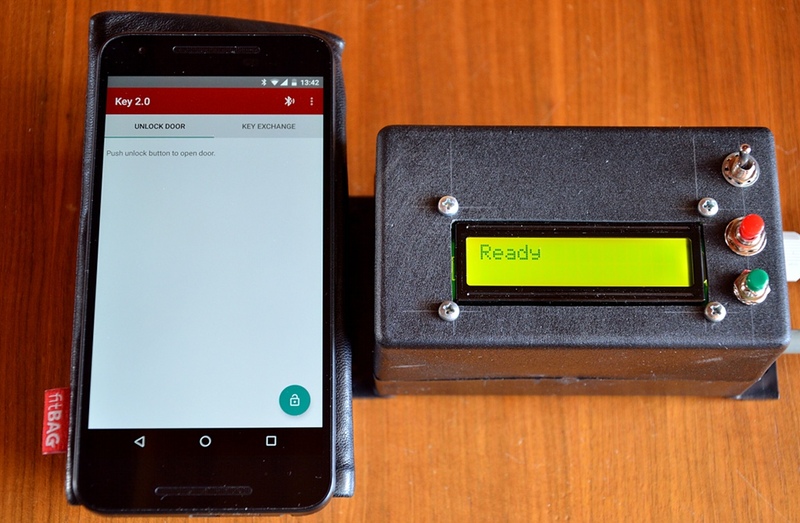 Mobile app implementing the user interface to unlock the door and communicating with the door lock controller through BLE. The following image shows the Key20 door lock controller device and the Key20 app running on a smartphone. Using state-of-the-art security mechanisms (Elliptic Curve Diffie-Hellman Key Exchange (ECDH), HMAC) to protect against attacks. Open-source software and hardware, including an open implementation of the security mechanisms. No security by obscurity! Source code for the app and door lock controller as well as Eagle files (schematic and board layout) are available on GitHub. 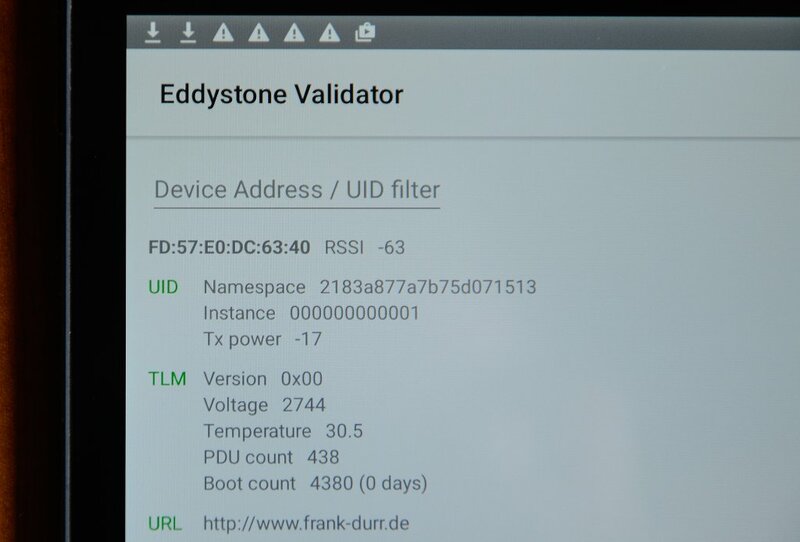 Works with BLE-enabled Android 4.3 mobile devices (and of course newer versions). Porting to other mobile operating systems like iOS should be straightforward. A door lock obviously requires security mechanisms to protect from unauthorized requests to open the door. To this end, Key20 implements the following state of the art security mechanisms. All door open requests are authorized through a Keyed Hash Message Authentication Code (HMAC). A 16 byte nonce (big random number) is generated by the door lock controller for each door open request as soon as a BLE connection is made to the door lock controller. The nonce is sent to the mobile app. Both, the nonce and the shared secret, are used by the mobile app to calculate a 512 bit HMAC using the SHA-2 hashing algorithm, which is then truncated to 256 bits (HMAC512-256), and sent to the door lock controller. The door lock controller also calculates an HMAC based on the nonce and the shared secret, and only if both HMACs match, the door will be opened. The nonce is only valid for one door open request and effectively prevents replay attacks, i.e., an attacker sniffing on the radio channel and replaying the sniffed HMAC later. Note that the BLE radio communication is not encrypted, and it actually does not need to be encrypted since a captured HMAC is useless when re-played. Moreover, each nonce is only valid for 15 s to prevent man-in-the-middle attacks where an attacker intercepts the HMAC and does not forward it immediatelly but waits until the (authorized) user walks away after he is not able to open the door. 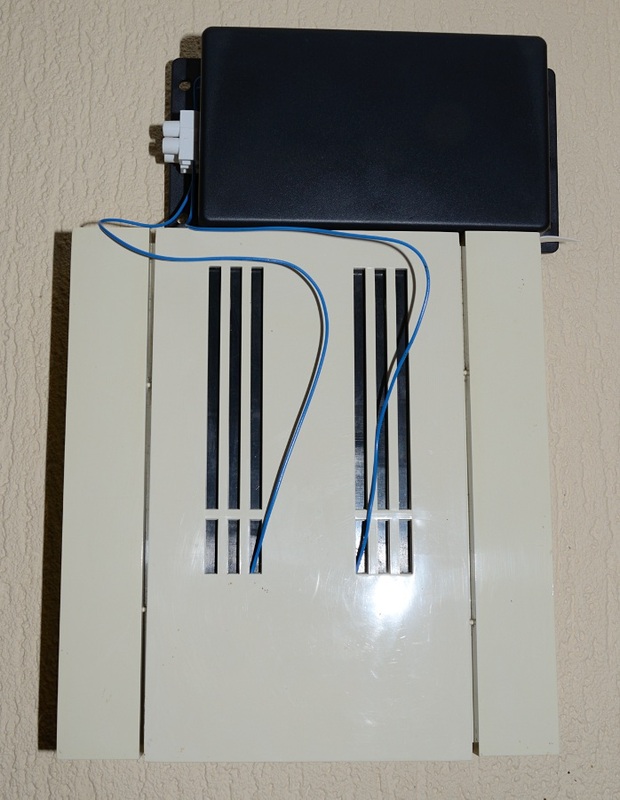 Later the attacker would then send the HMAC to the door lock controller to open the door. With a time window of only 15 s (which could be reduced further), such attacks are futile since the authorized user will still be at the door. Note that the whole authentication procedure does not include heavy-weight asymmetric crypto functions, but only light-weight hashing algorithms, which can be performed on the door lock device featuring an nRF51822 micro-controller (ARM Cortex M0) very fast in order not to delay door unlocking. With respect to the random nonce we would like to note the following. First, the nRF51822 chip includes a random number generator for generating random numbers from thermal noise, so nonces should be of high quality, i.e., truly random. An attack by cooling down the Bluetooth chip to reduce randomness due to thermal noise is not relevant here since this requires physical access to the lock controller installed within the building, i.e., the attacker is then already in your house. Secondly, 128 bit nonces provide reasonable security for our purpose. Assume one door open request per millisecond (very pessimistic assumption!) and 100 years of operation, i.e., less than n = 2^42 requests to be protected. With 128 bit nonces, we have m = 2^128 possible nonce values. Then the birthday paradox can be used to calculate the probability p of at least one pair of requests sharing the same nonce, or, inversely, no nonces shared by any pair of requests. An approximation of p for n << m is p(n,m) = 1 – e^((-n^2)/(2*m)), which practically evaluates to 0 for n = 2^42 and m = 2^128. Even for n = 2^52 (one request per us; actually not possible with BLE), p(2^52,2^128) < 3e-8, which is about the probability to be hit by lightning, which is about 5.5e-8. Obviously, the critical part is the establishment of a shared secret between the door lock controller and the mobile app. Anybody in possession of the shared secret can enter the building, thus, we must ensure that only the lock controller and the Key20 app know the secret. To this end, we use Elliptic Curve Diffie-Hellman (ECDH) key exchange based on Curve 25519. We assume that the door lock controller is installed inside the building that is secured by the lock—if the attacker is already in your home, the door lock is futile anyway. Thus, only the authorized user (owner of the building) has physical access to the door lock controller. First, the user needs to press a button on the door lock controller device to enter key exchange mode (the red button in the pictures). Then both, the mobile app and the door lock controller calculate different key pairs based on the Elliptic Curve 25519 and exchange their public keys, which anyone can know. Using the public key of the other party and their own private keys, the lock controller and the app can calculate the same shared secret. Using Curve 25519 and the Curve 25519 assembler implementation optimized for ARM Cortex-M0 from the Micro NaCl project, key pairs and shared secrets can be calculated in sub-seconds on the nRF51822 BLE chip (ARM Cortex M0). Without further measures, DH is susceptible to man-in-the-middle attacks where an attacker actively manipulates the communication between mobile app and door lock controller. With such attacks, the attacker could exchange his own public key with both, the lock controller and the app to establish two shared secrets between him and the door lock controller, and between him and the mobile app. We prevent such attacks with the following mechanism. 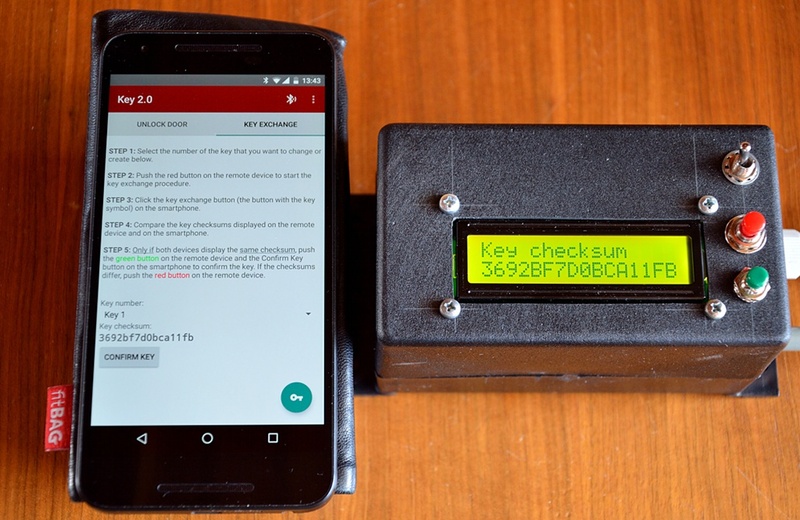 After key exchange, the mobile app and the door lock device both display a checksum (hash) of their version of the exchanged shared secret. The user will visually check these checksums to verify that they are the same. If they are the same, no man-in-the-middle attack has happened since the man in the middle cannot calculate the same shared secret as the door lock controller and the mobile app (after all, the private keys of door lock controller and mobile app remain private). Only then the user will confirm the key by pressing buttons on the door lock controller and the mobile app. Remember that only the authorized user has physical access to the door lock controller since it is installed within the building to be secured by the lock. The following image shows the mobile app and the door lock controller displaying a shared secret checksum after key exchange. The user can confirm this secret by pushing the green button the the lock controller device and the Confirm Key button of the app. 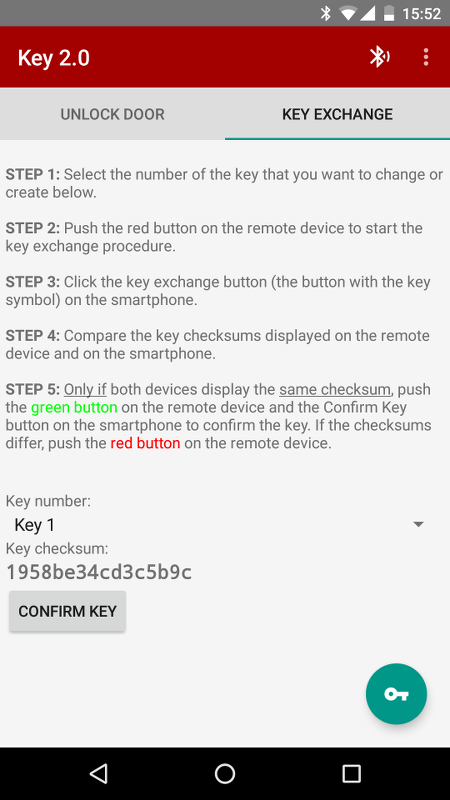 Key 2.0: key checksum verification after key exchange. 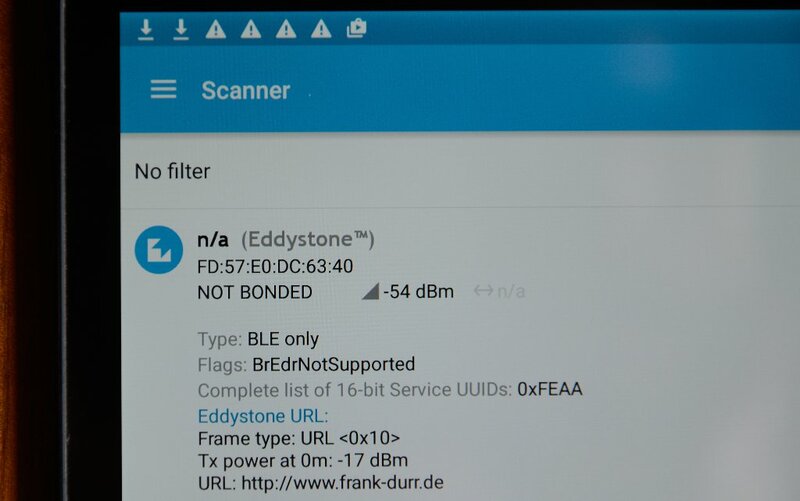 Why not Standard Bluetooth Security? Actually, Bluetooth 4.2 implements security concepts similar to the mechanisms described above. So it is a valid question why don’t we just rely on the security concepts implemented by Bluetooth? A good overview why Bluetooth might not be as secure as we would like it to be is provided by Francisco Corella. So we refer the interested reader to his page for the technical details and a discussion of Bluetooth security. 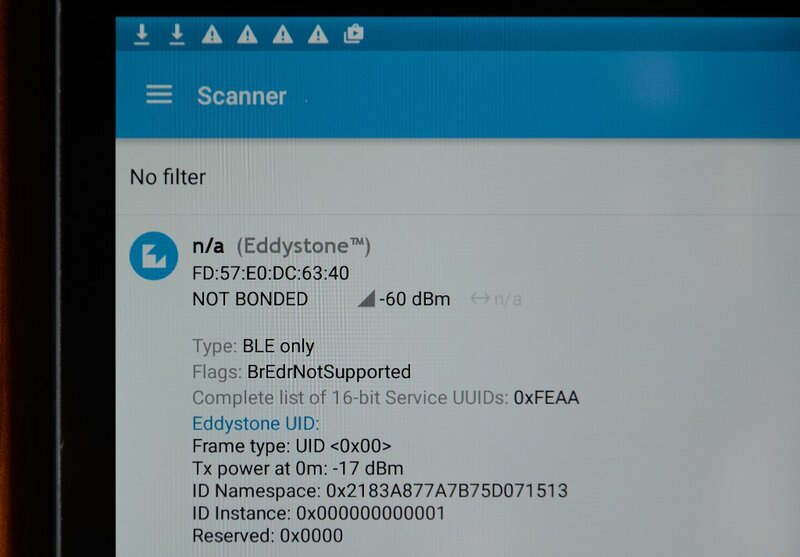 We also would like to add that many mobile devices still do not implement Bluetooth 4.2 but only Bluetooth 4.0, which is even less secure than Bluetooth 4.2. So we decided not to rely on Bluetooth security mechanisms, but rather implement all security protocols on the application layer using state of the art security mechanisms as described above. 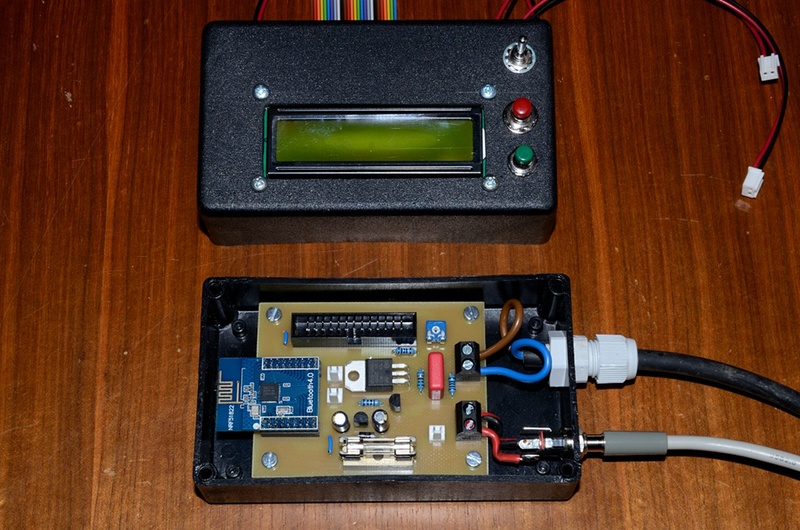 The following image shows the door lock controller and its components. The Door Lock Controller Device needs to be connected to the electric door lock (2 cables). You can simply replace a manual switch by the door lock controller device. The door lock controller needs to be placed in Bluetooth radio range to the door and inside the building. Typical radio ranges are about 10 m. Depending on the walls, the distance might be shorter or longer. In our experience, one concrete wall is no problem, but two might block the radio signal. The main part of the hardware is an nRF51822 BLE chip from Nordic Semiconductors. The nRF51822 features an ARM Cortex M0 micro-controller and a so-called softdevice implementing the Bluetooth stack, which runs together with the application logic on the ARM Cortex M0 processor. An LCD is used to implement the secure key exchange procedure described above (visual key verification to avoid man-in-the-middle attacks). For more technical details including schematics, board layout, and source code please visit the Key20 GitHub page. The app requires a BLE-enabled mobile device running Android version 4.3 “Jelly Bean” (API level 18) or higher. 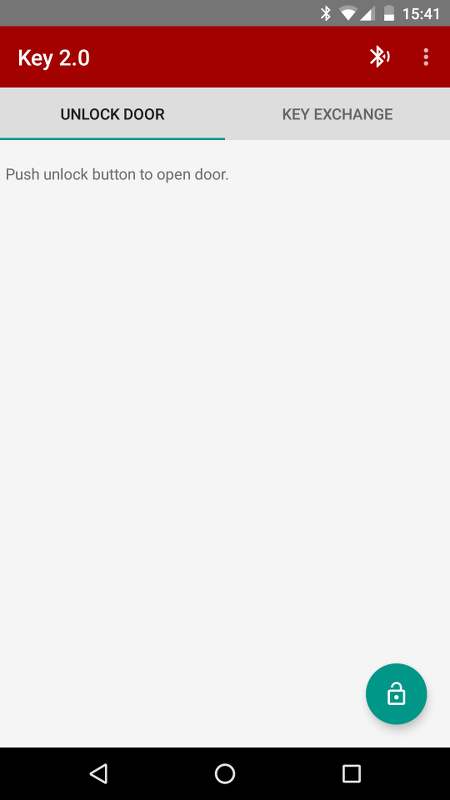 The following images show the two major tabs of the app: one for opening the door, and the second for exchanging keys between the app and the door lock controller. The source code is available from the Key20 GitHub page. The Internet of Things (IoT) envisions a world where virtually everything is connected and able to communicate. Today, I want to present one such IoT application, namely, the BLE-V-Monitor: a battery voltage monitor for vehicels (cars, motorbikes). 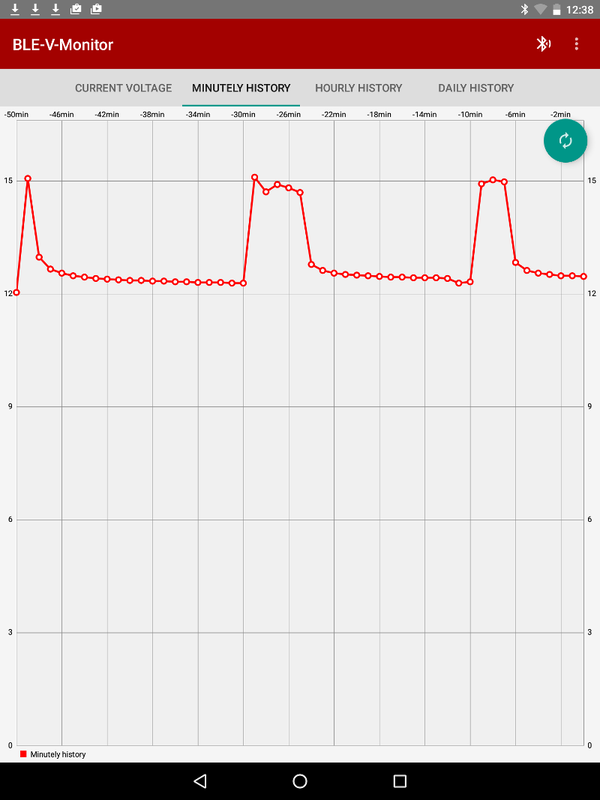 BLE-V-Monitor consists of an Arduino-based monitoring device and an Android app. The BLE-V-Monitor device is connected to the car battery to monitor the battery voltage and record voltage histories. 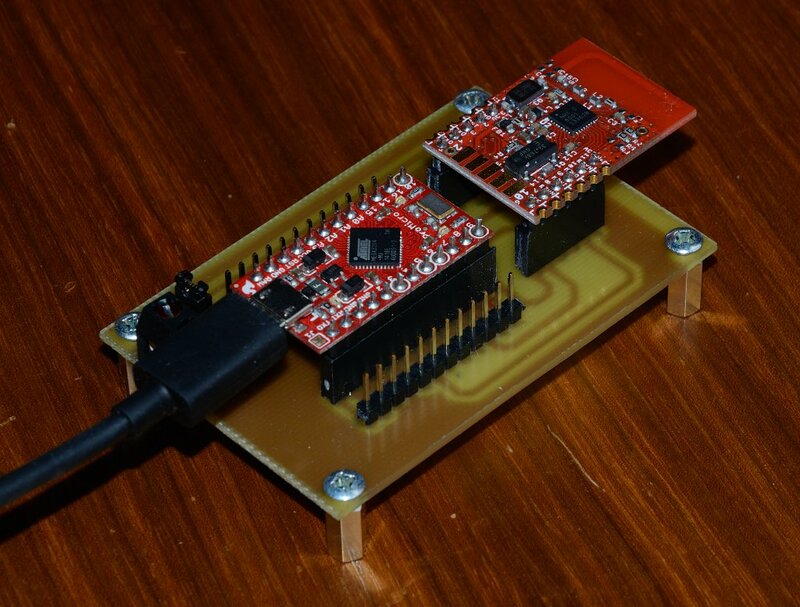 The app queries the current voltage and voltage history via Bluetooth Low Energy (BLE) and displays them to the user. Below you can see an image of the circuit board of the BLE-V-Monitor device and two sceenshots of the app showing the current voltage, charge status, and voltage history. Bluetooth Low Energy (BLE) to transmit voltage samples to smartphones, tablets, Internet gateways, etc. 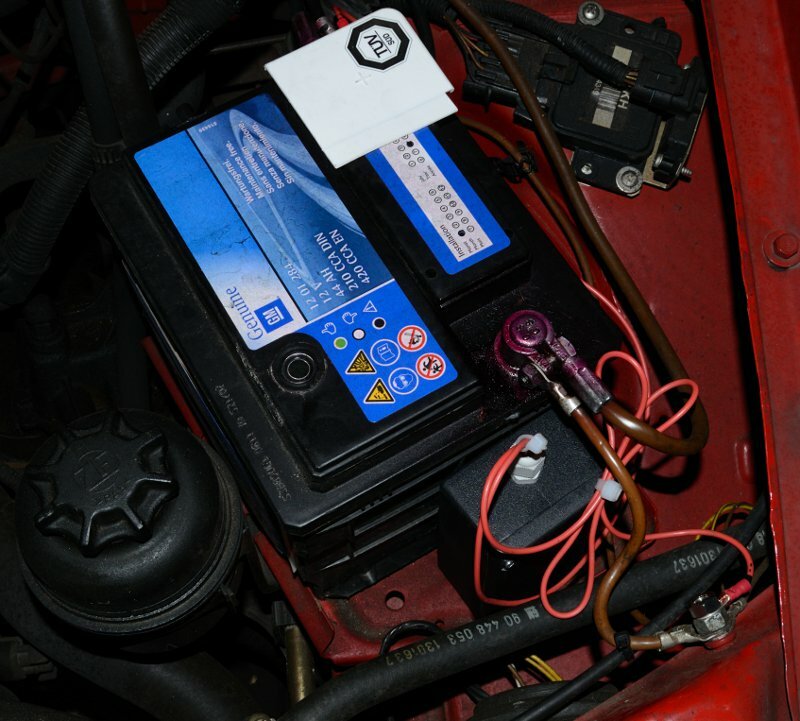 According to a recent study of ADAC (the largest automobile club in Europe), 46 % of car breakdowns are due to electrical problems, mostly empty or broken batteries. Personally, I know several incidents, where a broken or empty battery was the reason for breakdowns of cars or motorbikes. So no question: there is a real problem to be solved. The major problem with an empty battery is that you might not realize it until you turn the key, or for those of you with a more modern car, push the engine start button. And then it is already too late! So wouldn’t it be nice if the battery could tell you in advance, when it needs to be recharged and let you know its status (weakly charge, fully charged, discharged, etc.)? That’s where the Internet of Things comes into play: the “thing” is your car battery, which is able to communicate its voltage and charge status using wireless communication technologies. Keep it as simple as possible: Simple and commonly available hardware; through-hole PCB design to allow for simple etching and soldering. Very low energy consumption. What is the use of a battery monitor consuming substantial energy? Just to give you an idea that this is not trivial even considering the fact that a car battery stores a lot of energy (usually more than 40 Ah even for smaller cars): Consider the current of one standard LED, which is about 15 mA connected through a resistor to your 12 V car battery. After two hours, this LED and the resistor consumed 2 h * 15 mA * 12 V = 30 mAh * 12 V energy. Now, assume starting your motor with a starter motor drawing 50 A on average over a 2 s starting period. In this scenario, starting your motor once consumes 2 s * 50 A * 12 V = 28 mAh * 12 V. Thus, in less than two hours, the LED and its resistor consumed about the same energy as starting your car once. I know, this scenario is highly simplified, but it might serve to show that even a small consumer (in our case the BLE-Monitor device) is significant if it is running for a long time. Consequently, as a goal we want to bring down the average energy consumption of the monitoring device far below 1 mA. Technically, BLE-V-Monitor consists of the BLE-V-Monitor device already shown above and a smartphone app for Android. The BLE-V-Monitor device periodically samples the voltage of the battery, and the app uses Bluetooth Low Energy (BLE) to query the battery voltage when the smartphone is close to the car. Instead of using a smartphone, you could also install some dedicated (fixed) hardware (e.g., a Raspberry Pi with a Bluetooth USB stick in your garage), but since I walk by my car every day and the range of BLE was sufficient to receive the signal even one floor above the garage, I did not consider this option so far. In order not to lose data while the smartphone is not within BLE range, the BLE-V-Monitor device records minutely, daily, and hourly histories in RAM, which can then be queried by the smartphone. This approach based on BLE has several advantages: It is cheap. It is energy efficient. Clients can be implemented with many existing devices since BLE is commonly available in most consumer devices, in particular, mobile devices and cheap single-board computers like the Raspberry Pi (using a Bluetooth USB stick). The BLE-V-Monitor device is based on the Arduino platform. It uses an ATmega 328P microcontroller and the BLE module MOD-nRF8001 from Olimex with the Nordic Semiconductors BLE chip nRF8001. 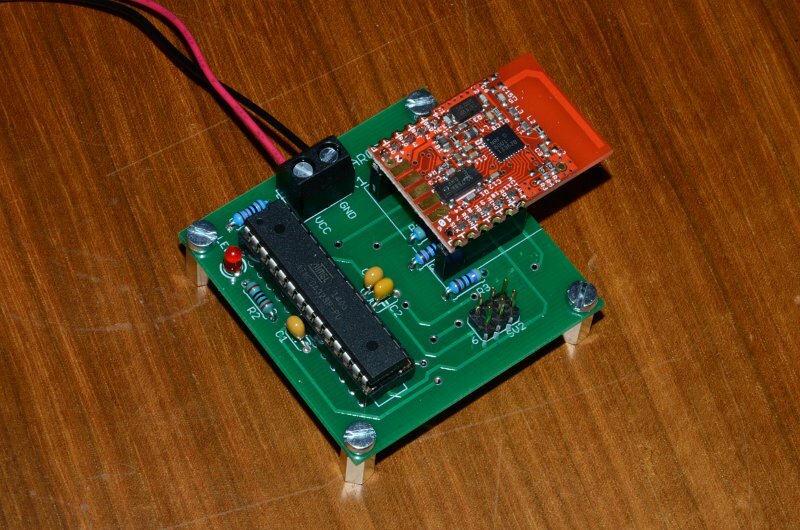 The ATmega is programmed via an in-system programmer (ISP) and interfaces with the BLE module through SPI. Overall, if you build this device yourself, the hardware might cost you less than 20$. And since we rely on a simple and energy efficient microcontroller and BLE together with small duty cycles, the current consumption can be below 100 microampere (including everything like the 3.3 V voltage regulator to power the microcontroller and BLE module from the car battery). To measure voltage, we use the 10 bit analog/digital converter (ADC) of the ATmega (no extra ADC component required). The voltage range that can be measured ranges from 0 to 18 V, thus, the resolution is 18 V / 1024 = 17.6 mV, which is fine-grained enough to derive the charge status of the battery (see voltage thresholds below). Note that while the car is running, the car’s alternator provides more than 12 V to charge the battery (about 15 V for my car as can be seen from the voltage history screenshot). A voltage divider with large resistor values (to save energy) is used to divide the battery voltage. Since we use a 2.5 V reference voltage, 18 V is mapped to 2.5 V by the voltage divider. The 2.5 V reference voltage is provided by the very precise micropower voltage reference diode LM285-2.5, which is only powered on demand through a GPIO pin of the ATmega during sampling to minimize energy consumption as much as possible. Since the resistors of the voltage divider have large values to save energy, a 100 nF capacitor in parallel to the second resistor of the voltage divider provides a low impedance source to the ADC (this 100 nF capacitor is much larger than the 14 pF sampling capacitor of the ATmega). A 18 V varistor (not shown on the image; it’s an SMD on the backside of the PCB since I only had an SMD version available) protects from transient voltage spikes above 18 V. Since varistors typically age whenever they shunt excessive voltage, a fuse limits the current to protect against a short circuit of the varistor. 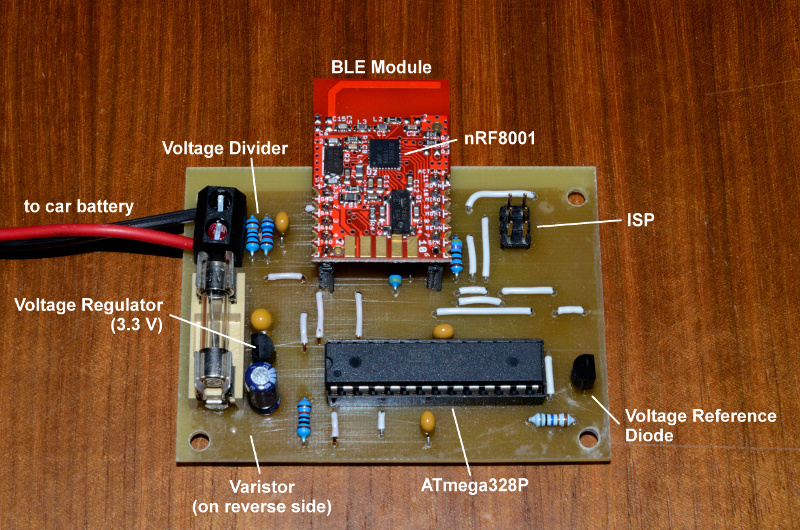 A micropower voltage regulator (LP295x) provides 3.3 V to the ATmega and BLE module. The 100 mA that can be provided by this regulator are more than sufficient to power the ATmega and BLE module while being active, and a very low quiescent current of only 75 microampere ensures efficient operation with small duty cycles. 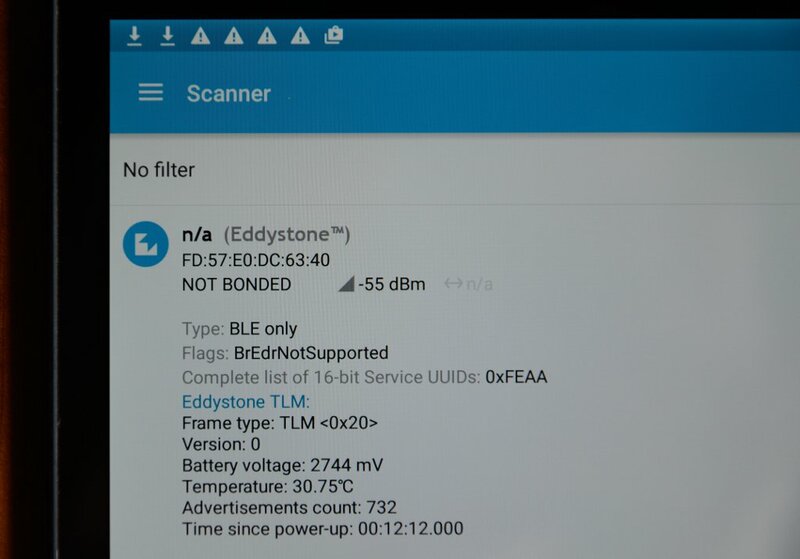 The BLE-V-Monitor App is implemented for Android (version 4.3 or higher since we need the BLE features of Android). It consists of a tab view with a fragment to display the current voltage, and three more fragments to display minutely, hourly, and daily voltage histories, respectively. 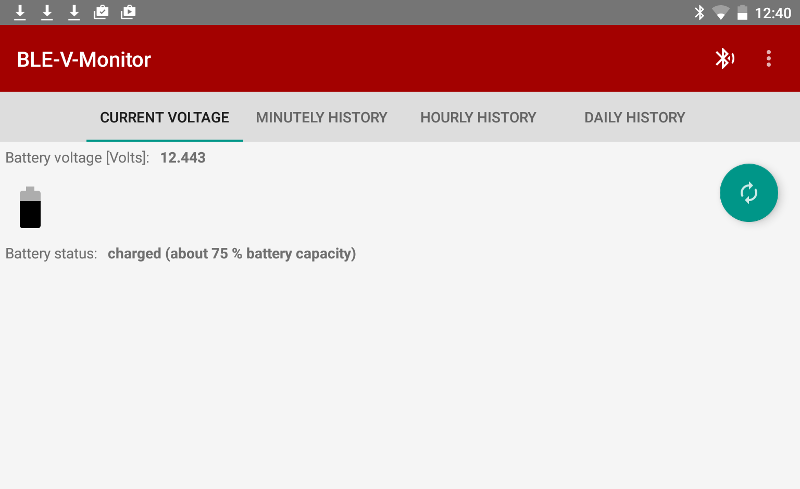 The screenshots above show some examples of the current voltage, charge status, and voltage histories. In the history screenshot you can also identify two periods when the car was running where the charging voltage reached about 15 V.
The following photos show how the BLE-V-monitor PCB is mounted inside a case and the placement of the monitoring device right in front of the battery of my car (in this photo, the device is already connected to the battery but not yet fixed). Fortunately, older cars have plenty of space and not a lot of useless plastic hiding every part of the motor. The pull relief (knot) might not look very elegant but it is highly effective. Obviously, plastic is the better choice for the case since the Bluetooth module is inside. Still, I had some concerns that all the metal of the car would shield Bluetooth signals too much, but it works suprisingly well. Even one floor above the garage with the metal engine hood and a concrete ceiling between device and client I can still receive a weak signal and I can still query the battery status. Obviously, there is some potential to further improve the functionality. Beyond just monitoring the raw voltage and mapping it to a charge status, we could analyse the voltage data to find out whether the battery is still in a healthy condition. For instance, we could look at voltage peaks and analyse the voltage histories to find out how quickly the battery discharges, and how these values change over the lifetime of the battery. To this end, you could send the data to the cloud. Although I think, you could implement such simple “small data” analytics also on the smartphone or even on the microcontroller of the monitoring device. However, the battery or car vendor might want to collect the status of all of their batteries in the cloud for other reasons, for instance, to improve maintenance and product quality, or to offer advanced services. With the cloud, everything becomes a service, so why not offering “battery as a service”? Instead of buying the battery, you buy the service of always having enough energy to operate your car. When the performance of your battery is degrading over time, the vendor already knows and sends you a new battery well before the old one is completely broken or invites you to visit a garage where they exchange the battery for you (this service would be include in the “battery as a service” fees). I hope you found this little journey to the IoT interesting. Have a good trip, wherever you go!